With Bad News, there is ALWAYS GOOD! Unbelievably, it has nearly been a year since the Cycle for a Cause crew hit the road from Salt Lake City to Seattle, Washington. From there we began the 1600-mile, 21 day, Seattle to San Diego “Cycle for a Cause” ride. As the 2010 summer has progressed, I (Max Kuszaj) have struggled with what type of bike ride I wanted to organize for charity to be completed this fall. As I was weighing out options, and discussing them with new and previous ride participants, I came to a huge “bump” in the road that would result in the cancelation of any ride ideas for this fall. It is with great regrets to announce, the Cycle for a Cause crew will not be participating in a charity ride this October due to a motorcycle accident I was involved in on August 13th. Instead I will be focusing my time on recovering from my injuries that were resulting from my accident. Trust me, there is no other place I would rather be than on the road with my friends laying down miles for an amazing cause. This fall will have to take a “rain check” for me personally so I can rehab my body from the broken bones. Be sure not to worry, the Cycle for a Cause will resume this up coming 2011! Please stay tuned to our website for updates. If there is anyone interested in participating, or has ideas themselves for a ride or charity work, please contact me through email. Please be sure to check out the photos I am posting from ski photographer Alex O’brien, who was onboard with us from San Francisco to San Diego. He captured some amazing moments from the second half of the ride. I am sorry Alex it took me this long to put them on the site. Cycle for a Cause Athletes at the San Diego finish line! 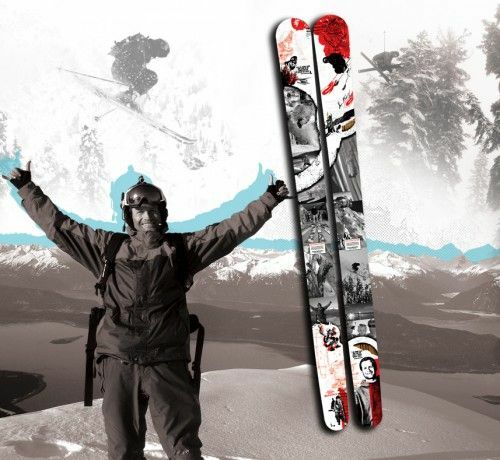 WIN A PAIR OF K2 SHANE MCCONKEY TRIBUTE SKIS! Raffle includes: a Tribute pair Shane McConkey K2 Pontoon’s, Go Pro Cameras, an “UnderGround” Revolution Snowboard, Discrete Gear, Scott USA Product, Skullcandy Gear, NEFF swag, Utah Resort Lift Tickets, Nike 6.0 gear, MSP DVD’s and much more. LIVE music by CODI JORDAN, UnderGround Drink specials, late night music by DJ KNUCKLES, MSP movie screenings of “In Deep” and “Something About McConkey”, athlete appearances, and much more. XSI will also be in attendance to spread awareness of their insurance offerings to athletes. Since the arrival in San Diego less than a week ago, I have had time to relax, reflect and think about the 24 days spent on the road raising awareness with an amazing group of athletes and friends. Now that the ride has come to completion, I need to express the point that the cause will live on, and the spreading of awareness to the public must continue. As freeskiing athletes and friends we are involved in an amazing industry, but one that needs a lot of direction when it comes to the health and well-being of its’ participants. Yes, it is a one-of-a-kind industry in many ways, and one that has consumed my life for nearly 10 years. I have met the most amazing individuals, traveled the world, and have made the best family of friends one could ever imagine possessing. With the stream of tragic accidents continuing, injuring and claiming the lives of friends, something needs to be changed. When I say “something” I am stressing the health, life, and general insurance freeskiing athletes cannot carry to protect themselves and their families against the financial struggle that may occur with an accident. I cannot think of another industry where the athletes and participants involved are in a situation like this, and it MUST improve. Common questions often linger in my mind constantly. “Why can’t an athlete receive health insurance with a sponsor when signing a contract?” “Why can’t athletes like us receive life insurance that is affordable?” “How can companies turn their backs on an athlete who is in need after an injury?” The questions continue on and on, and for some reason I cannot find the proper answers, and that I have an “EXTREME” issue with. I hope that with events like the “Cycle for a Cause” we can bring some awareness and shed some light on these answers. Our quest to pedal the West Coast was a success. Being surrounded by a group of people who share these concerns, who want to bring the necessary change to our world of freeskiing is what made this achievable, enjoyable and memorable. I cannot express my gratitude enough. You all have hearts of gold, buns of steel and the experience of sharing the open road with you is one I will never forget; Pep Fujas, Dave Steiner, Jesse Hall, Cody Barnhill, Jackie Paaso, Angeli VanLaanen, Alex Obrien, Tom Dolezel, Sherry McConkey, Tal Fletcher, Suz Graham, Carston Oliver, Greg Strokes, Tess Weaver, Derek Taylor, Tony Zentil, Matt Barber, Ian Graham, Mike, Casey, Katie, Shane (forgive me for not knowing your last names), ‘Super Nanny” Jen, and Ayla McConkey. Thank you for your pedal strokes and support of this ride. This ride would not have happened without the financial and corporate support from the companies that have helped. The appreciation and gratefulness we have to you all is inexplicable. And finally, thank you Riley Poor, Shane McConkey and Billy Poole for being the inspiration in my life. You are what made this happen. Today was the final leg of our 24-day grueling journey along the Pacific Coast. We started the day off in Newport Beach, CA with our crew (plus Tom Dolezel’s friend, Mike) and headed down the PCH to Laguna to meet up with the Oakley posse consisting of Greg Strokes, Tess Weaver, Matt Barber, and Tony Z. Once catching up with them, we all pedaled on to Dana Point to meet Derek Taylor from Powder Magazine. From there our crew was complete, and we motored on towards San Diego, a ride roughly about 90 miles. Having some new, strong, and less fatigued riders was great and made the riding much easier for the crew that has been on the road for 3-plus weeks. Thanks you guys for “pulling” the crew along and all the support. It was amazing to see the group grow as the ride continued on each day, and having 20-plus individuals for the final day showed what an impact this ride has made in such a short time. We pedaled on to Encinitas to meet briefly for some coffee and food to fuel the final push to La Jolla and finally, San Diego. Once in San Diego, we were met at the finish line at Mission Beach by Alex Obrien, Ayla McConkey, Jen the “Super Nanny”, Craig Coker, Michael Olenick and many others handing out “high fives” and hugs. The support from all was felt all around. As much as it was amazing to San Diego, it almost felt anticlimactic after all the days on the road. But standing there on the boardwalk along Mission Beach surrounded by friends and family, in the sunset, and watching Sherry and Ayla play on the beach, it all made sense as to why we did this ride. Thank you everyone that was involved and all the support. None of this would have, or could have happened without you. Riley, Shane and Billy, we all love you and this was for you guys. As far as all the riders involved, Pep, Dave, Jackie, Jesse, Suz, Cody, Sherry, Tal, Carston, Shane, Ian, Alex, Angeli, Tom, Greg, Tess, Derek, Tony, Matt, Mike, Casey, Katie and everyone else (if I failed to include you, I’m sorry) you guys are amazing and thank you! Stay tuned for more photos and blogs from the final days and after ride events in San Diego. An after-ride conclusion party will take place in Salt Lake City later in November. Information for this will be up soon. AND SHANE…FROM PEP AND I, THIS PHOTO IS FOR YOU…. Today was one of those days…one of those days where no matter what you do, or try, things just don’t go the way you planned them or wanted them to. As usual, the crew set out at separate times with a 40-mile halfway meeting point established. Tal started off the day rough, with 2 flats before we even left the campground. The day would only get better from here. My group of Dave, Pep, Tom, and Tal powered through the bike paths and side routes of Santa Barbara and the Pacific Coast Highway. Pep suffered some mechanical issues with one of his tires and needed the tire replaced, so he fell off our group and stopped at a shop for repairs. Tal experienced his 3rd flat of the day, and then was rescued by the Canadian RV when the bead on his tire would not hold on to his front rim. We all made it to the midway meeting point with the support truck along the Pacific Coast and regrouped and planned the rest of the long afternoon to Malibu. Jesse and Suzanne pedaled on, followed by Steiner and Carston who made a push on solo, then Tom and myself, and finally the rest of the group including Pep, Shane, Jackie, Sherry, and Cody. The directions were a little vague, but everyone managed to navigate through Ventura and Oxnard eventually and towards Malibu. Here is where it all “hit the fan.” Shane struck something in the road and went over the handlebars while pedaling and required multiple staples in his head. So while the crew that was riding with him was occupied with his medical attention, Alex ran into problems and had a flat tire on the truck. Luckily, he managed to be in front of us down the PCH so we were able to assist him with the spare tire. By the time the truck was ready to go, the sun was setting and 25 miles remained till Malibu. Jesse, Suz, and myself pushed on along side the sunset (with our highlights and tail lights) and pedaled out the final miles to Malibu and our hotel in the pitch dark. Right behind us arrived a sweaty Pep, who decided to keep pedaling even after the Shane accident, and also managed to get in 100 miles for the whole day. Much needed sleep is in order for tonight and thoughts of 2 more days of pedaling to San Diego is on our minds and in our dreams. Tomorrow is slated out to put us in Newport Beach.